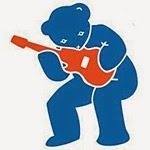 I began my vocal training at Blue Bear School of Music more than 20 years ago. That makes it especially exciting to bring the workshop I originated with vocalist-educator Daria to this welcoming school. San Franciscans, this one is for you -- after fun and successful sessions for singers at any level in Oakland and Novato, Calif., last spring and summer. Explore your voice in this nonjudgmental setting. Are you a singer, whether in the shower or on stage? Start the new year right with this revitalizing workshop! Contact me at lisabmusic at hotmail.com to attend or ask questions! All levels welcome!